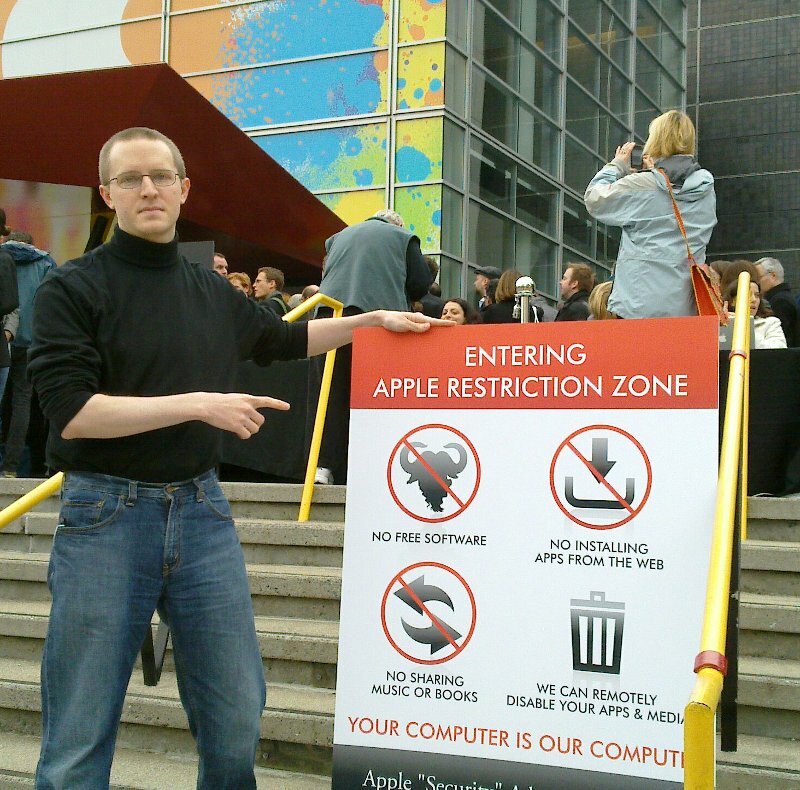 SAN FRANCISCO, California, USA – Wednesday, January 27, 2010 – As Steve Jobs and Apple prepared to announce their new tablet device, activists opposed to Digital Restrictions Management (DRM) from the group Defective by Design were on hand to draw the media’s attention to the increasing restrictions that Apple is placing on general purpose computers. 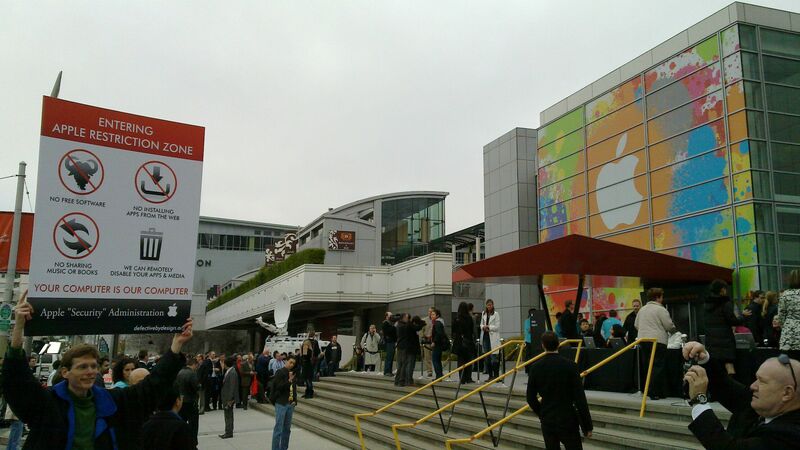 The group set up “Apple Restriction Zones” along the approaches to the Yerba Buena Center for the Arts in San Francisco, informing journalists of the rights they would have to give up to Apple before proceeding inside. DRM is used by Apple to restrict users’ freedom in a variety of ways, including blocking installation of software that comes from anywhere except the official Application Store, and regulating every use of movies downloaded from iTunes. Apple furthermore claims that circumventing these restrictions is a criminal offense, even for purposes that are permitted by copyright law. “Attention needs to be paid to the computing infrastructure our society is becoming dependent upon. This past year, we have seen how human rights and democracy protesters can have the technology they use turned against them by the corporations who supply the products and services they rely on. Your computer should be yours to control. By imposing such restrictions on users, Steve Jobs is building a legacy that endangers our freedom for his profits,” said FSF executive director Peter Brown. Other critics of DRM have asserted that Apple is not responsible, and it is the publishers insisting on the restrictions. 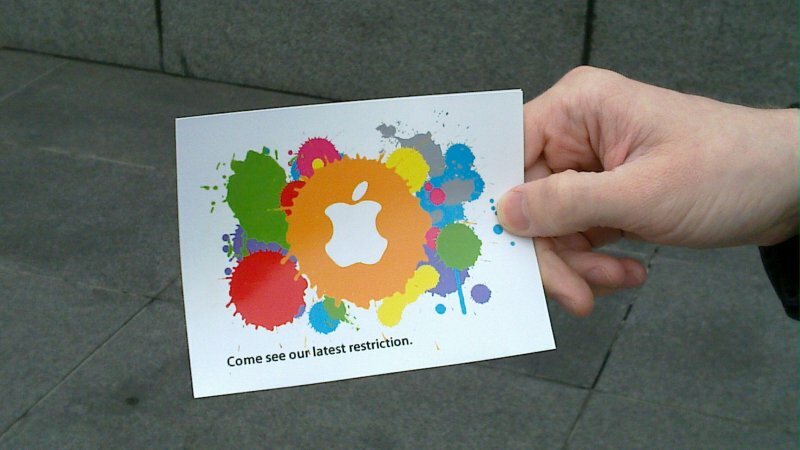 However, on the iPhone and its new tablet, Apple does not provide publishers any way to opt out of the restrictions – even free software and free culture authors who want to give legal permission for users to share their works.